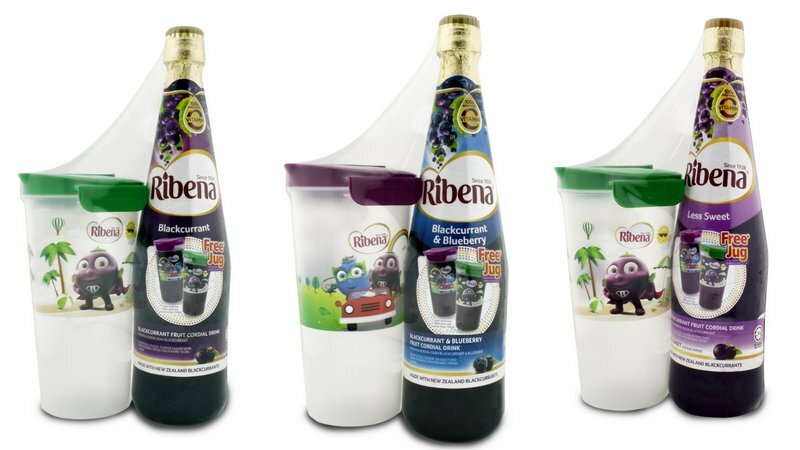 The one drink I thoroughly associate with during my growing up years - which is a long long time ago if you must know - is Ribena. My mum would often make a glass of Ribena for my sister and me when we come home from school, something which I look back with fondness since it is always great to have a refreshing and thirst-quenching drink! Now that I am a parent myself, Ribena is still the drink for my monkies in the household. Especially since not only is it made from 100% New Zealand Blackcurrants, it is rich in Vitamin C and contains no artificial colour, flavour or sweetener! Oh, have you wondered why is Ribena purple in colour? That's because it comes from the natural purple colour from fruit skin: Anthocyanin. In fact, no matter whether you are drinking a ready-to-drink Ribena Tetra pack, Cheerpack or Sparkling version, each 200ml glass of Ribena drink provides a child’s daily Vitamin C requirements! Nowadays, the monkies have taken a liking to adding a slice (or two) of lemon to their Ribena drink but truth be told, there are so many things you can do with this blackcurrant juice drink than just adding water to it. And for a dessert that will be a sure-fire hit with the kiddos, one can never go wrong with this. Our kitchen isn't exactly the biggest around so we do not have the luxury of having an oven. So the wifey is always on the lookout for easy-to-make dessert recipes that do not require any baking and these Ribena Cheesecake Cups totally fit the bill. And the best part? 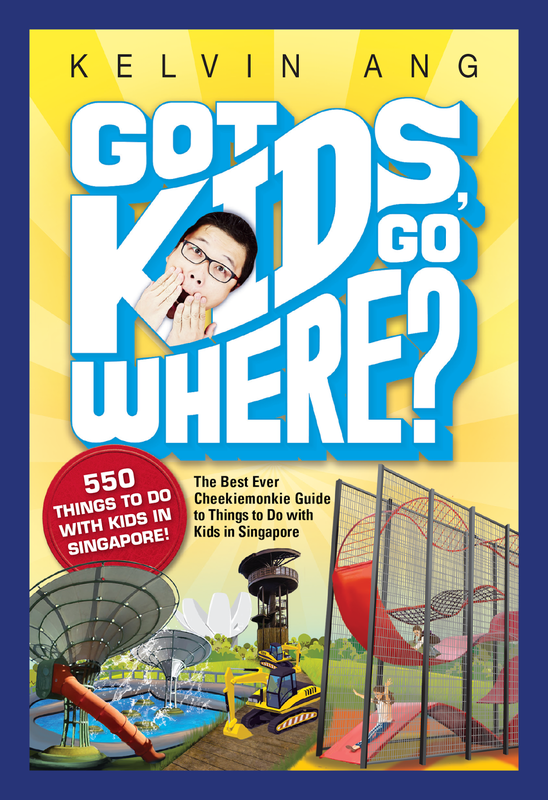 The process is pretty easy enough for kids and parents to do together! 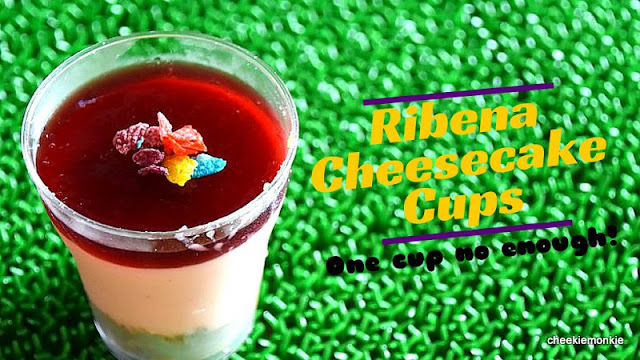 This recipe will yield 8 cups of Ribena Cheesecake Cups. The initial part requires the smashing of the Digestive biscuits in a pan - something that the monkies took great delight in. When the biscuits are all crumbled and resemble fine sand, add in the melted butter and mix thoroughly. Scoop a tablespoon of the mixture into the individual cups. We got the cups from Phoon Huat ($6.80 for 10 cups) by the way. Press down the mixture with a spoon to make it more compact, and place the cups in the freezer while preparing the next cheese batter. Firstly, add gelatin to the water and stir well. Double boil the mixture to allow the gelatin to dissolve. Set aside to cool. Next, add the cream cheese to a mixer and cream it well to obtain a smooth texture. Add the tofu, caster sugar, cooled gelatin mixture and grape Vitagen, and mix well. And the cheese batter is all done! Pour the batter into cups and set in freezer for 30 minutes. Next, the main star of the recipe - Ribena! Mix the Ribena cordial, water and gelatin in a pot. Boil the mixture on low heat until the gelatin dissolves. Allow mixture to cool. Once the 30 minutes is up, pour the Ribena mixture into the cups. Leave the cups in the freezer for a further 15 minutes and IT IS DONE! You can store the cups in the chiller until they are ready to serve. Drizzle the cups with toppings such as strawberries, blueberries or as the monkies dictated, rainbow cereal! When the monkies first saw the fruits of their labour, they all exclaimed it looked so pretty! Well, the admiration did not last long though as they were only to eager to have a taste of the dessert. And their verdict? One is definitely not enough! In fact at the time of writing this post, I have only 2 cups remaining in my chiller with 6 cups being devoured in less than 6 hours! Gosh. I guess the great thing about these Ribena Cheesecake Cups are they are just the right portion for an adult or child... which makes it perfect for parties. So with the success of this recipe, I guess I will have to search online for other creative ways to incorporate Ribena Cordial into more equally fun and simple recipes that even the monkies can whip up! And if you need to stock up on more Ribena cordial too, Ribena is currently having a promotion for its cordial - receive a Free Jug with every 1L Ribena Cordial purchase! More reasons to use Ribena Cordial as an ingredient for simple dishes, dessert, and beverages if you ask me!